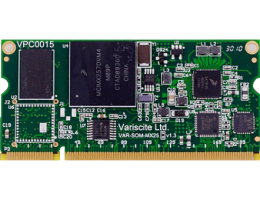 The VAR-SOM-MX25 is a cost optimized, highly integrated, low-power System-On-Module which serves as a building block and easily integrates into any embedded solution. It includes all vital peripherals / interfaces and is ready to run any embedded operating system such as Linux, Windows Embedded CE Embedded CE. This page was last modified on 20 July 2016, at 02:51. This page has been accessed 13,788 times.